Current status: Physically available and legally recorded. 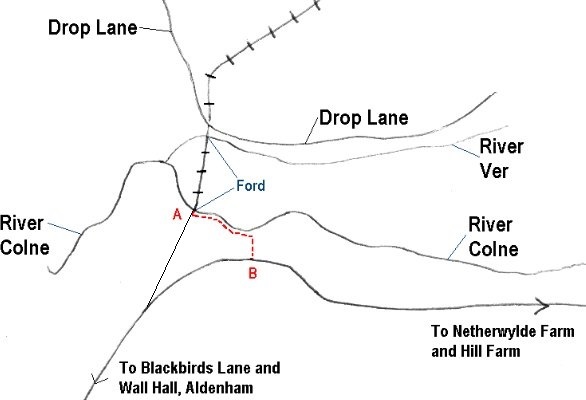 The route from Bridleway St Stephen 10 at the river crossing Aldenham 77 (Point M on the plan to the right) to Restricted Byway Aldenham 20 (Point E) is being considered for recording by the Hertfordshire County Council, following our application to record the route. In 1995, we collected evidence of use so that we could make an application to have the route added to the definitive map and so protected for the future. We topped up the evidence in 2003. In 2016, the application started to be processed by the County Council. They asked if we have any further evidence to put forward before they come to a decision and members and friends of members collected plenty of statements of use covering the intervening years. Feb 17: we're told the County Council has made a decision on our application, and look forward to hearing what it is! Jul 17: The order was made and the objection period is over. We understand that no objections were made, and await formal notification by the Council. If confirmed, we will have completed the legal work on this path. 9 Aug 17: The Council received no objections and so confirmed its order on 28 Jul 17. The application to record this route was made on 1 May 1995. Commencing from RB 20 at TL 1430 0121, N for approx. 30m to TL 1430 0124 and WNW following the River Colne for approx. 130m to join BR 23 at TL 1419 0129, S of the ford. Width: Varying between 2.7 metres and 7 metres as shown in the Hertfordshire County Council (Aldenham 97) Modification Order 2017.